Mr G, Molly and I have been coming over to this lovely bay for years now. 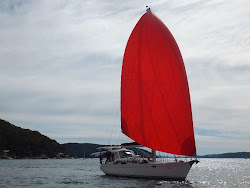 Our permanent boat mooring is just on the other side of Pittwater so its a short hop across the bay to pull up a spare mooring and break out lunch or the 5pm wine and cheese. .
Towlers Bay - also known as Morning Bay - is perfect for boaters with a wide sandy beach at it's end. During the warmer months the beach is crowded with families, boat tenders and motor boats every weekend. Thankfully they all go back to work during the week and leave the beach in a peaceful state...you can even see the occasional wallaby on it at dusk or early early in the morning. On the eastern edge of the bay there is a smallish beach with the ruins of steps leading up a wooded hill. There are also old rusty rails leading out into the water which must have worked one time as a lift for goods or supplies for the house or settlement at the top of the hill. The only thing left of the settlement is an old fireplace and a forlorn set of steps - easily imagined as the front porch steps. The area is the preferred place for responsible dog owners. You can go ashore on the beach at low tide and climb the hill to explore the ruins .. Molly loves it and will go in a clearing which is easy to pick up in. The mystery is this....during the early evening a lone man arrives in a tin dingy. We have never seen him arrive or leave. We just look and seemingly he has just appeared. He sits at the top of the hill in the trees on the top step of the old porch. He sits there all night. We've never seen him leave. While the light is still reasonable we can see him just sitting there...sometimes we see the flash of a cigarette being drawn. Spooky. We used to go across when he was there to take Molly for her evening toilet. He's there as we approach but then he moves way back into the woods and disappears...no where to be seen. Mr G and I wonder .. is he a devil worshipper? A while back there used to be a few boats there with him ... but only one boat sits on the beach now. Is he sadly waiting for a lost love one? Who knows. He was there again last night. Again we didn't see the boat come into the bay we just saw it as we were taking Molly ashore. So, with the last full moon of the year shining brightly, we decided to go to the big beach. Best to give our mystery man his hill for this evening at least.